An easement can be created by a grant or deed, by implication, or by prescription. An easement created by a deed should be in writing and should define the terms and scope of the agreement. This type of real property instrument creates a non-possessory interest in land that allows one person to use another's property for a specific purpose. 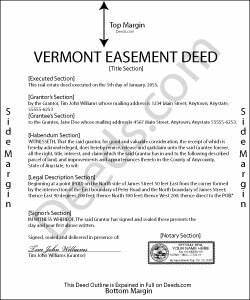 As an interest in real property, an easement deed in Vermont is required to be signed and acknowledged by the grantor before recording can take place. The acknowledgment of a deed in Vermont can be taken before a town clerk, notary public, master, county clerk, or judge or register of probate. Acknowledgments taken before a notary public will be valid without an official seal being affixed to the notary's signature ( 341a). Vermont recognizes acknowledgments taken out of state if the acknowledgments are taken according to the laws of such state ( 379). Real estate documents in Vermont are recorded in the town or city where the property is located. This is different from many other states that have a county recording system. Recording an easement deed will impart constructive notice of the contents of the instrument. Unless an easement deed is acknowledged and recorded, it will not be effective to hold such lands against any person but the grantor and his or her heirs ( 342).